I have the photo-proof that my husband, Amar, and I were in the same kindergarten class. It's the cutest thing in the world to look at our own kindergartner and think that we were that age, in the same class, not knowing where our lives would take us. I am beyond blessed to have built a love and a family with such an amazing man. We celebrated our 10th wedding anniversary party this past weekend, with a sweets and champagne party for our closest friends and family. I shared the party invitations *here* - and used the same design elements (the font, the doilies) throughout the full party. It took a few hours, three sharpies, and part of an ikea roll of white drawing paper (from the kids' section) to write out our vows. It was a hit with our guests, and made the evening all the most personal and special to us. A huge thanks to Marlyn, of Montreal Confections, for the ah-mazing ruffle cake and beautiful sugar cookies. Also to Melanie, of Gourmet Shop, for her yummy cheesecakes in jars. Do you see the "white chocolate truffles" apothecary jar? I made little boxes (using *this die*) and stamped each one with a doily before popping a little lindt truffle into each. They didn't quite match the party decor, but they are my favorite! Leftover candy melts, popped into a rose mold, fit perfectly stacked into a skinny flower vase. I got a bit cheeky with the little flags on the cake pops: "we did!" and "we still do!" - I put the same flags around the stems of the champagne glasses. As a party favor (because every good party gives something away at the end, right?) I die-cut the same doily out of fabric (with a fusible backing) and ironed it on to a muslin bag (the same kind I used for our Christmas advent calendar). They turned out looking so sweet! It's nothing extravagant, but a little thank you card from the both of us, and a few more of our favorite chocolates. We had such an amazing time, and will for sure be looking back at these sweet memories for years to come. And, if the love between hubby & I isn't enough (wink), there's a little blog-crush-campaign going on at Damask Love, where we're spreading the love to blogs we admire. My blog crush is The little big company. Their website is a one-stop shop for all things party: straws, favor bags, everything. But on their blog they feature the most amazing vintage-style parties. swoon! I made a square invite, and cut two white doilies that I folded over the invitation details. A vanilla-colored ribbon added a sweet closing detail. The backs of the doilies and the vanilla ribbon were hidden with another white card-stock square. I like how heavy and sturdy this made the whole invitation. 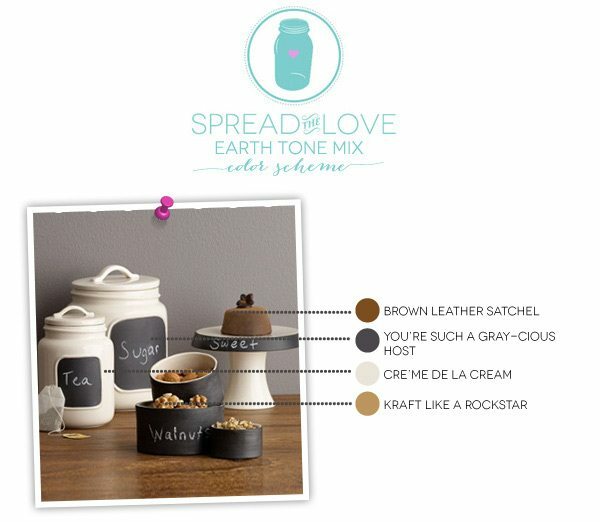 I hope you'll click over to Amber's blog to see how you can "spread the love"! And I hope you'll come back and check out all of the sweet party details tomorrow. I love a pretty monogrammed card set. This one's for the february PTI blog hop. I went for simple but elegant with this one, mostly because I wanted an excuse to play around with my new "mini blooms" stamp set and the pink zing powder I ordered. I embossed the florals onto a piece of rustic cream cardstock and cut the letters with the cameo silhouette. A pop of aqua mist cardstock and a set of kraft envelopes rounded out my set. I'm thrilled to have this gift on hand, all ready to gift to Sofia's teacher at the end of the year. I procrastinate on everything, so this is making me really proud! Thanks for stopping by - happy hopping! I have babies on the brain, lately, with my new niece being a week old. I've managed to see her a few times, and every time I hold her, it's glorious. When they weigh under 8 pounds, and snuggle themselves to sleep in your arms, you feel like all is right in the world. I'm chatting about this card over at the Precious Remembrance blog this morning, and then it will be a mad dash to finish baking and decorating for our at-home-anniversary party this evening. Hubby and I hit our first milestone: 10 years! I can't wait to show off some pictures next week! Congratulations, you two! Please email me at "mom2sofia@gmail.com" so that I can connect you with the right person to collect your prize. Also, the grand prize winner - picked at random from all of the blog hop comments, and winner of the Ribbon Carousel prize, is Kelly Booth! Congrats, Kelly! Thank you so much for all of the encouragement and kind words you left me on the blog hop post - I wish I had a prize for everyone! Happy weekend - mine will be filled with all kinds of lovely: it's my 10th wedding anniversary today, and we are hosting a little party tomorrow evening. Love is sweet! Here's your fortune for the day: play leap-frog with a unicorn and you will suffer very badly. hee. I'm back showcasing "Good Fortune" - another new and super cute lawn fawn set for inspiration week! I saw this particular "fortune" (which is actually very sage advice) on pinterest somewhere, and I thought a fawnie version would be hilarious. I did giggle a bit as I was creating it. I did some masking to be able to stamp the fortune cookie "in front of" the take-out box and the chopsticks. I then stamped the unicorn (from critters ever after) at the bottom and then masked everything to be able to stamp the new "sharp backdrops" in behind. I love that new background set - it's so great! I also blended some soft brown ink to tone down that background a bit and have it all blend together. I was able to type a custom fortune, and have it follow the same path as the sentiments that come with the set. I did it using my silhouette software. If you'd be interesting in learning how I did that, leave me a comment - I'd be happy to do a short video tutorial. This is my second post today! I'd love it if you checked out my oscars-inspired card *here* or just scroll down. Welcome to the third inspiration week post with lawn fawn! Today, we're showing off the mini happy easter set - it's so adorable! I did some masking on the left side of the card to show all of the bunnies and the little chickie hanging out together. The one bunny set himself apart to play hard-to-get, I think *wink* I stamped the little dashed lines to show the hopping path his little friend took to get to him. I cut out and propped up my two main bunnies, to draw the eye across and over to them. I colored the bunnies with a very subtle stripe of a light warm grey marker, and gave them little blushy cheeks and pink ears too. I'm bringing back the liquid appliqué - it's still perfect for creating bushy bunny tails. My sentiment was custom-stamped using the new Riley's ABCs alphabet set. I set it on a long strip of patterned paper that I folded under the card, and had peek around the other side. And, there's that fringe again! I might give it a rest for the next little while - hee. One last decorative touch was to punch double holes in the patterned paper and lace some green/white lawn trimming in there. Today, some of the CSS designers are rolling out the red carpet to bring you cards inspired by oscar-nominated movies. It is beyond embarrassing to admit that I have only watched a handful of these movies, and that handful includes "Brave." Because, I have kids. And also: I loved it. But that isn't the movie that inspired my card today. I was inspired by "life of Pi." I stamped and masked a trio of clouds, and sponged inks in yellow, orange, red, and had it fade to a blue ocean at the bottom. I also die-cut a few of the clouds and stamped a soft grid pattern (from "airmail") behind for some added texture. And, more fringe fun: I used the same Martha Stewart scissors that I did *here* to create yet another fringe, but this one is a double! I worked the cardstock with my hands to break down its fibers and to make it more pliable, and then created a ruffle. Once the ruffle was secured with a row of stitches, I used the MS scissors to create a fringe on either side. They underline the sentiment, and also stand for a whimsical ocean. I love it. The little liquid pearls were created based on a different inspiration point: I love collaborating with my friend Marlyn, from "montreal confections" and she was inspired to create cookies based on the same movie. I love that we can inspire each other, across different mediums! Aren't they just the most beautiful works of art?? I squealed when I saw them. this is my second post of the day! If you are looking for my lawn fawn inspiration week post, click *here* or scroll down. Time for another lawnscaping challenge! This one is perfect for all of your critter sets: stamp a scene. I needed to pad my stash of boy birthday cards a bit, so I made this magical birthday card, where dragon and his friend griffin are ready to dig into some cake. And how exactly do you get the candles lit at a party like this? Dragon takes care of things like a boss. I stamped each element onto my white panel, and then again onto a separate sheet of white cardstock. I colored, cut out, and popped up each image for a fun but still clean and simple scene. The little looped banner and navy polka dot patterned paper are my fave. 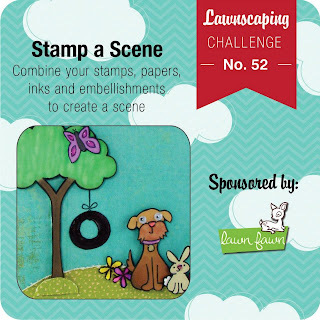 You could win a free stamp set of your choice from lawn fawn! Happy Monday, and I guarantee it's about to get a little cheerier for you, because we're introducing lawn fawn's "pink lemonade" line of patterned papers. It's such a bright and happy set! I made a set of treat boxes, and I called them "springtime treat boxes," because doesn't it just look like I opened up all the windows, put on rain boots, and went to mulch my garden? Honestly - springtime. Each treat box was assembled in the same way: I started out with a white box (using the CSS cube die), and just wrapped a length of patterned paper around each one. Some strategic scoring made it sit nice and tight. I hope you can see better with the package opened. I only adhered the bottom of the white box to the patterned paper strip, and, folding the tops, kept it in place with a mini-clothespin. I think this is such a fun and easy easy way to incorporate your event colors, or party scheme into your favor boxes. Everyone likes to see what's inside, right? hee. I found these organic bunny-shaped chocolate cookies at the grocery store. Nothing more perfect for Easter, or a spring-themed party! I kept the decorating very simple, but you can go all out if you want! I tied bows using our new lawn trimmings, and tucked them under the clothespins. On the end of the cord, I dangled a little punched heart. And, my favorite is the one to the left: I punched out a circle and popped up the "e" onto the box base. Pink and yellow is so fun together, isn't it? 3. my sister just gave birth to a beautiful baby girl last night, and I will be holding that bundle of sweetness in a few hours - swoon! On to the craft! haha. I am helping to show off the new "summertime charm" set by lawn fawn. I made my own jar 'o jam by hand-drawing a little squiggly line near the top of the jar (with a memento ink marker, so I could copic-color it in with no bleeding.) The sentiment on the jam jar label was printed on the computer, in a font that I thought looked handwritten (if your handwriting looks that pretty - kudos, and do that instead. I love seeing pretty handwriting mixed in with stamps.) I added the scallop on the top of the label, but it would look adorable stamped right under the jar lid too. I used patterned paper and stickers from the pink lemonade collection - aren't they a breath of fresh air? I especially love this cute little floral. And, the lawn trimmings I used to tie around the jar lid is amazing. I love how stiff it is, and how it holds its shape perfectly. I couldn't help but stick a cut strawberry right next to my punny sentiment (groan. sorry, but you know how much I love these - you *may* be seeing another custom one this week.) The strawberry was smothered in glossy accents to add a bit more dimension and texture to the card. Thanks for stopping by my blog! I may be a little giddy this morning, from the excitement of presenting new lawn fawn stuff along with the other talented girls!